Finland’s pavilion for the Shanghai World Expo 2010 is called Kirnu, or ‘Giant’s kettle’. 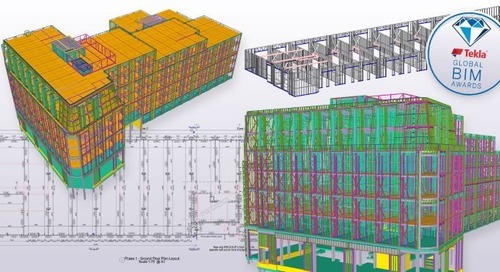 Tekla Structures BIM (Building Information Modeling) software is being used to model and manage its structural information in 3D throughout the project. The use of Tekla Structures supports the pavilion being constructed as a laboratory for sustainable building. A big challenge for the near future is to find methods of construction that are sustainable and preserve natural resources. The Kirnu pavilion is a laboratory for sustainable building, presenting Finnish solutions for future urban construction. The goal is to develop energy-efficient, low-emission and environmentally friendly solutions in terms of construction method and maintenance properties. Finland is one of around 70 participants, states and companies, building its own pavilion for the Expo 2010. Designed by JKMM, an architects’ office in Helsinki, the pavilion won first prize in a design competition announced for the occasion. 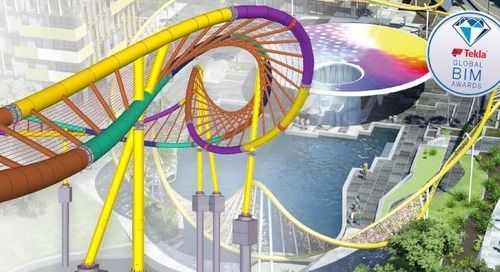 The design incorporates, for example, renewable energy sources. The construction materials and methods have been selected so that construction generates as few greenhouse gas emissions as possible and the building will be easy to disassemble and rebuild after the Expo. 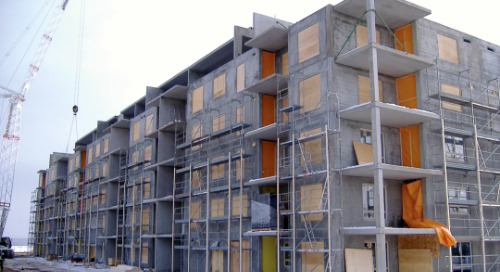 In addition to efficient structural design and lean prefabrication and construction, the Tekla 3D building information model is being utilized in a variety of innovative ways throughout the project: to fit in elevators, HVAC systems, and a giant canvas that will cover Kirnu’s inside atrium, as well as to assist in its interior design and later rebuilding and relocation using augmented reality technology. Finnish project constructing company Lemcon Ltd was selected for the project management of the Finland pavilion’s construction at the Shanghai Expo 2010. A consultancy agreement was signed between Lemcon and project owner Finpro. Lemcon China Co. Ltd provided full project management, 3D design coordination using Tekla Structures software, and supervision related to the pavilion’s construction. Lemcon was also responsible for the design and construction of the Finland pavilion at the Hannover World Expo in 2000. “The Task Manager function in Tekla Structures is particularly useful, because we’ve been getting weekly reports from China, including illustrative snapshots, of what parts have been installed on which level,” said Artur Virit of Lemcon Finland. “Tekla experts in Finland have been very helpful in finding a solution to any structural challenge that has come up during the project. A light Web version of the model has been exchanged through the Internet to be able to communicate about the structure in detail, and the Tekla database file has been sent back and forth through a Web link to create a combined model of different phases of installation. I believe that the new Model Organizer function in Tekla Structures would have been a great help at the very cramped site,” Virit said. Conceptual structural design by Finnish engineering office Aaro Kohonen Oy provided the idea of a space frame structure system for the Kirnu pavilion. The final structure of the pavilion uses 21 lattice pipe columns, which are variable cross-sections and unique curved shapes. The floor is made of composite decks that can be disassembled. “Tens of thousands of bolt connections were needed in the building to enable easy disassembly after the Expo. 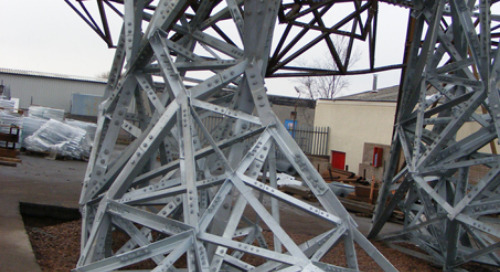 A challenging part in the project was to design and detail all these bolt connections accurately,” said Pekka Haanpää, Lemcon’s design coordinator in China. The final 3D building information model of Kirnu will simulate its real-world as-built structure. 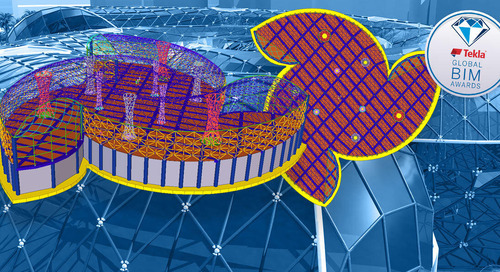 Shanghai Engineering Survey and Design (SCAD) Ltd created a 3D structural model with Tekla Structures that will be used throughout the construction process of Kirnu. Lemcon China Co. Ltd Shanghai office provided design coordination and supervised SCAD in utilizing Tekla to produce the model, and Tekla Shanghai and Tekla Finland provided software support for Lemcon’s BIM pilot in China. As the cladding processing period for Kirnu is long, the design and fabrication of the cladding was done at an early phase to ensure that the construction can be finished on time. 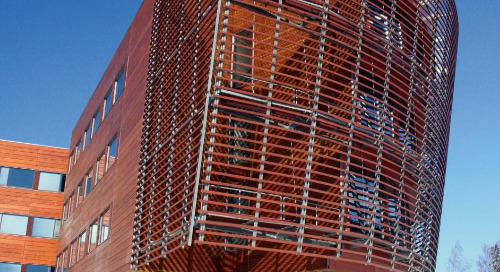 JKMM Architects used Rhinoceros software to design the shingle cladding. The cladding surfaces were imported into Tekla Structures as position references to ensure that the shape of the steel structure is designed correctly. The Tekla model was then exported into Rhinoceros to double-check the cladding position and shape of the building. 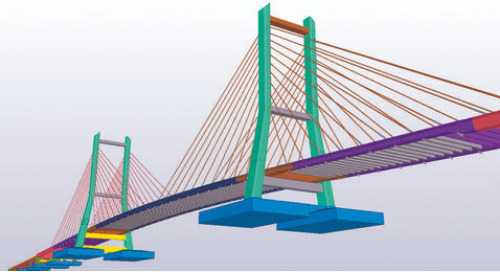 SAP 2000 software was used for the design calculations. Both SAP 2000 and Tekla support open API (Application Programming) that enables full roundtrip functionality between the two software applications. Because of this feature the Tekla model can be easily updated after calculations and vice versa. 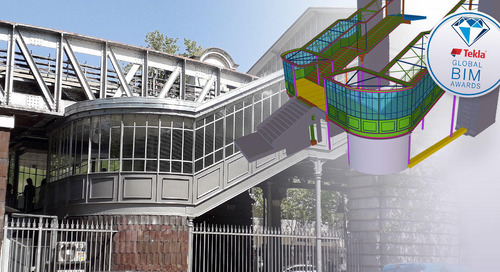 Detailed design for the construction was finalized with Tekla Structures after the calculations. Shanghai Baoye Construction won the bid for the Kirnu project’s steel fabrication and erection in April 2009. All steel parts and assemblies were named, numbered and specified according to the guidelines of design coordination. Bolt connection information was given to Baoye engineers, and they created connections to the Tekla model. “Engineers checked out the complex connections by rotating the model and were able to accurately generate all steel shop drawings from the structural model, thus saving in material costs and avoiding waste. It would have been impossible for engineers to convert this curved structure into 2D drawings by using just 2D software,” said Haanpää. 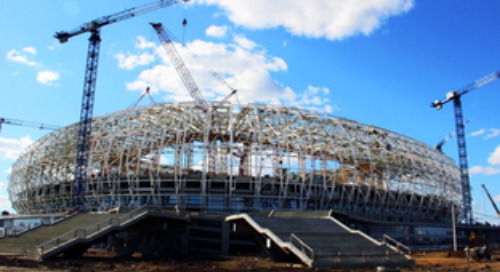 The construction management team used the 4D scheduling functions in Tekla Strucures to follow up on the steel fabrication process and erection of the building.